Harrachov ( German: ) is a town in Semily District, Liberec Region, in the northern Czech Republic, close to the border with Poland. It is situated on the Mumlava River, a left tributary of the Jizera within the Krkonose mountain range of the Sudetes, whose crest forms the Czech-Polish border near the Elbe rivers source. 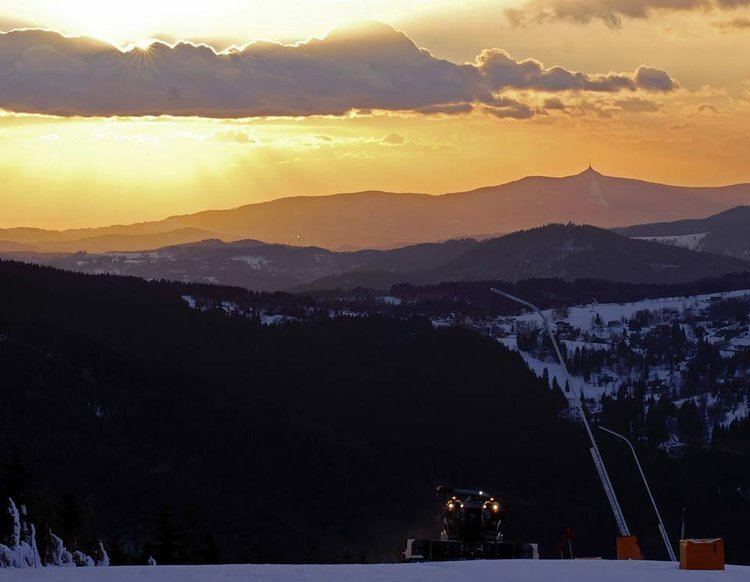 Located about 700 metres (2,300 ft) above sea level, Harrachov is one of the most popular Czech ski resorts including the internationally used Certak ski jumping hill (including flying hill); several winter sport events take place in Harrachov regularly. The whole region is of increasing importance for alpine tourism in Central Europe. The European route E65 from Prague goes through the town and crosses the border to Szklarska Poreba in Poland near the village of Jakuszyce. The first written reference dates back to the 17th century, when German settlers founded a village Dorfl there. In 1712 one Elias Muller from neighbouring Ryzoviste received the privilege by the local landowner Count Aloys Thomas Raimund Harrach to establish glassworks here, whereafter the adjacent settlement was renamed Harrachsdorf. Since the end of 19th century Harrachsdorf has been known for its glass production, textile industry, and mining. At the beginning of the 20th century, industrial production was bolstered by the construction of a cog railway line between Bohemian Tannwald (Tanvald) via the Izera railway down to Silesian Hirschberg (present-day Jelenia Gora). The fact that the nearest stop at the Strickerhauser hamlet was beyond the border of Austria-Hungary with the German Empire was not a major obstacle at that time. After World War II, the Silesian lands in the north fell to the Republic of Poland according to the Potsdam Agreement and the border was closed. The German population was expelled and its property seized according to the Benes decrees. In 1947 there were 1,553 people living in Harrachov. Trains from Tanvald had to terminate in Korenov, trains from Jelenia Gora were terminated in Jakuszyce (former Jakobsthal), on the northern side of the Novosvetsky pass. Instead of opening the border, the Communist governments of Czechoslovakia and Poland arranged a territorial exchange. In 1959, Czechoslovakia acquired the area around former Strickerhauser (Polish: , present-day Mytiny), which allowed it to extend the cog railway Tanvald-Korenov to the outskirts of Harrachov, while the northern continuation decayed. Poland was compensated by land to the north at Mrtvy vrch. Harrachov, joined by the originally independent villages Novy Svet (Neuwelt) and Ryzoviste, became a town in 1973. Cross border rail traffic was resumed in 2010.